I have one more cookie to show you before Christmas gets here. This is number three from the cookie swap I started talking about last week, and this is one I had wanted to try for a while. Last year for Christmas, I made a rum raisin pie, and the thought of those flavors in a cookie sounded like a great idea to me. The recipe is found in the Martha Stewart's Cookies book. I've said before that I'll eventually try every recipe in that book, and this gets me one cookie closer. As the name suggests, rum is involved in this recipe. However, there are no raisins as currants are used instead. For added interest, there's some orange zest and unsweetened coconut, and it all combines to make some very tasty cookies. Although this is an easy recipe, you need to soak the currants in rum overnight before starting. 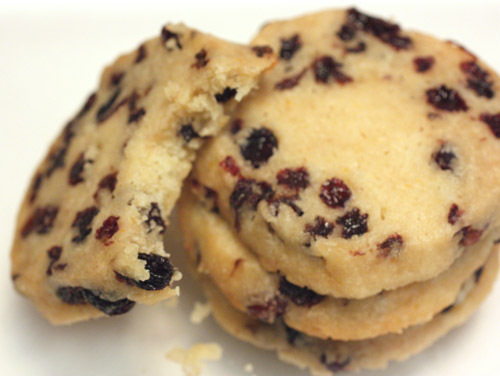 Then, the dough was a simple shortbread to which the drained, rum-soaked currants, unsweetened coconut, orange zest, and some reserved soaking rum and vanilla were added. It was divided in half, and each portion was placed on parchment paper and rolled into a cylinder. At this point, the dough needed to be refrigerated for at least a couple of hours but could have been chilled for a couple of days or frozen for a couple of months. I left it for a few hours and then pre-heated the oven while slicing the cylinders into cookies. There’s something fun about slice and bake dough. For such a simple cookie, there was a lot going on with its flavors. The rum and coconut were subtly delicious, while the orange zest grabbed more attention. Their small size made it easy to lose count of how many I’d eaten in one sitting, but who’s counting when it comes to cookies at this time of year? I can tell by the picture that these have a beautiful crumbly texture. They look lovely. I adore shortbread. Lisa, wish you a Merry X'mas and Happy New Year! Oh my... These look DIVINE! I adore shortbread cookies... Will have to give these a try... Maybe this wekeend. Thank you... And happy holidays!!! I love those little currants....I use them whenever I can! Merry X'mas & Happy 2010 to you!! not enough raisins - just kidding - HAPPY HOLIDAYS! Oh no.... I don't really like raisins that much, but you've done it with your wonderful looking shortbread. Now I have to go and buy some and make it. This looks over the top good. Happy Holidays Lisa! Oh wow, I love shortbread and have always been something of a traditionalist, but forget that - these look amazing. Merry Christmas and Happy holidays. Happy New year with good health to you and your family. The cookies sound delicious. Merry Christmas and Happy new Year! Much joy and sweetness to you and your family Lisa! OOOOOooooh I like these Lisa. Beautiful twist to shortbread! YUM!! Merry Christmas my dear, and hope the New Year is wonderful in every way! They look sweet, buttery and crumbly. Perfect for a cup of hot chocolate! These are lovely! buttery and melty...yum! Great looking cookies Lisa! Hope you had a wonderful christmas! Wow. These look divine! 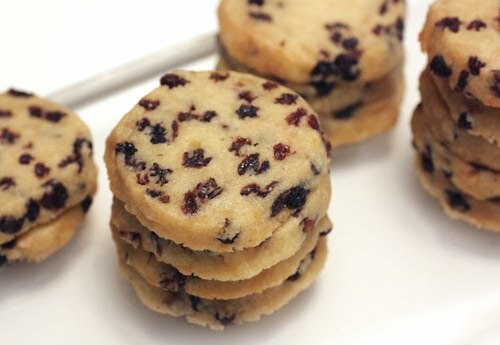 I love shortbread cookies but have never made them with rum and currants. I love that you are doing Martha's book cookie by cookie! These look so cute with the currants. I love the flavors you used in it. Perfect for holidays! Perfect shortbread, I must say. loved your rum currants shortbread. I have a bottle of rum soaked raisins sitting in the fridge given a friend and I'm thinking of making muffins. Happy Holidays!!! What a unique cookie - they look so festive and perfect for a cookie swap! Oooh Lisa!! What a georgous & ooh so festive shortbread!! Looks like this is a great cookie book to have. They are gorgeous again. Wish you have a rewarding and exciting 2010 ahead of you! This has to be one of the best cookies I've seen! So unique and delicious! I'm not always a fan of raisins in cookies, I must admit. But heck, add rum and I'm so there. I love that Martha Stewart Cookies book. I'll definitely have to look up this recipe, among the many others I'm still dying to bake. Great post! Looks delicious! I too have tried baking this from my Martha Stewart Cookies book and it is definitely yummy. As I have read in the internet this would really go well with a cup of coffee. Thanks for sharing this with us. Great pics too! It would be lovely to include the recipe here... just a thought. Anonymous: I don't re-print copyrighted recipes from books. Thanks for visiting!